The bus paused mid-span on the bridge over the broad Guayas river giving me a chance to look back on the Guayaquil skyline. It was hot, it seems to be always hot in Guayaquil. I guess that’s the desert for you. Although, the heat came as a surprise since we’d been shivering while waiting for our first bus in the coastal town of Olon that morning. Now we were heading up the mountains and possibly to chillier climes again to Cuenca, Ecuador’s third largest city. 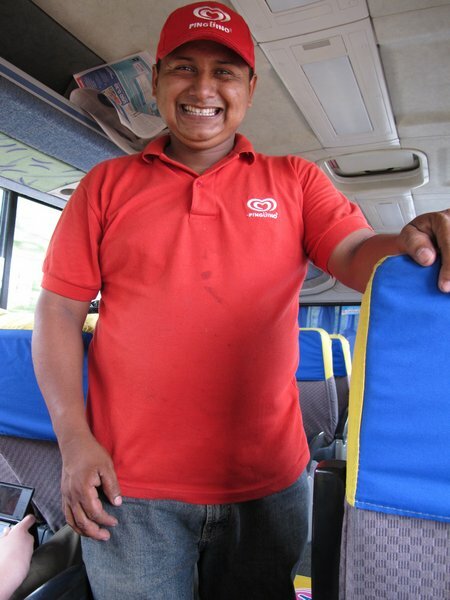 Since we’ve been taking buses in Ecuador the number and variety of salesmen, women and children who hop on and off buses all day long selling their wares has been fascinating to me. From Quito to Guayaquil, Guayaquil to the coast and back and now, on our way from Guayaquil to Cuenca, we’ve been offered chips, food, water, magazines, newspapers, chocolate, toothbrushes, and ice-cream by people who jump on at a random stop, walk up and down the bus selling and then hop off either before the bus starts moving or stay on for a while and leave at an equally random junction some miles on. The first time I saw someone seemingly abandoned by a bus driver on an empty stretch of road with their wares I was concerned. Now, that I know that travel by bus is the most popular way to get around Ecuador, I know they’ll likely just wait no more than 15 or 20 minutes for the next bus going the opposite direction and so spend their day going back and forth the same stretch of road selling. On the bus to Cuenca, the little boy who jumped on before we left the city limits of Guayaquil was selling very tasty-looking hot dogs but he forgot what he was doing and stood watching my boys play with their Nintendos for so long that I was starting to worry about him. When the engine roared he came to and dashed off the bus. This ice-cream seller (pictured above) came on at the next stop and promptly forgot his sales and tried to strike up a conversation with my husband – difficult when one doesn’t speak English and the other doesn’t speak Spanish. This was the first time that a bus-seller had stopped to chat. Then, giving up on his attempts at conversation, he asked us to take his photo and then, smiling from ear to ear, hopped off the bus. We passed fields of bananas and lime trees. Roadside stalls heavy with watermelons, pineapples, all manner of squashes – even pumpkins – and countless other varieties of fruits and vegetables. Obviously we were passing through Ecuador’s primary agricultural region. The bus climbed up to and above the clouds. We reached for our jackets, the heat of Guayaquil well gone. We passed through dripping, mossy, jungle and climbed higher. Our bus shuddered to a stop on a precarious bend, high in the mountains. Looking out the window, I could see an industrious construction crew working on the road. 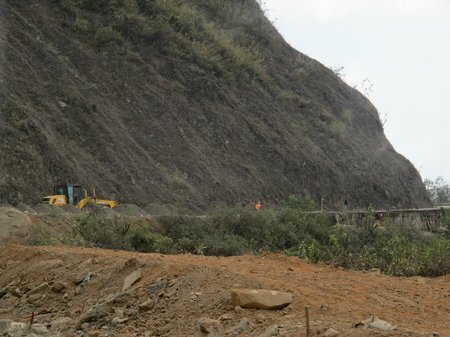 We’ve hit construction on every stretch of road we’ve traveled on in Ecuador so far as the country is obviously investing on widening roads and improving surfaces, adding concrete where once there was only mud. And so the journey went as we climbed up ever higher back into the clouds and then down into a valley where the sky was clearer, stopping regularly where the road was being built around us. We reached Cuenca in the early evening. The bus terminal was noisy, dirty and busy just like all the other bus terminals we’ve been to. We made our way to our hostel. Tomorrow we’ll explore. This entry was posted in Ecuador, International Escapades and tagged Cuenca, Ecuador on September 19, 2010 by wandermom.